According to reports, active terrorist groups in Pakistan shot martyred 2 innocent Shia Muslims, namely Haji Hussain Ali in Quetta, and Hasan Mohsin in Karachi Yesterday. According to the reports we received, Saudi-backed Wahhabi terrorists targeted a Shia Muslim named Haji Hussain in the locality of Gunjaan Abad, Quetta on Sarkolar road. Haji Hussain embraced martyrdom following the attack. According to the details, Haji Hussain Ali S/O Sultan Ali was targeted by the Wahhabi terrorists on his shop which is located on Sarkolar road, which is named Sakhi Autos. After the attack, the terrorists succeeded in fleeing away where as the area has been filled with FC and Police officials. Martyr Haji Hussain is shifted to CMH Hospital, from where he would be later shifted to Nichari Imambargah. According to reports, excommunicator Wahhabi terrorists opened fire and targeted a Shia Muslim Hasan Mohsin which resulted in his martyrdom. According to the details, activists of Sipah-e-Sahaba targeted the 60 year old Syed Hasan Mohsin Naqvi S/O Syed Mohsin Ali Naqvi in the locality of Nazimabad No. 2, outside Jamia Imamia. Martyr Hasan Mohsin Naqvi was the trusty of Jamia Imamia, who was later shifted to Abbasi Shaheed Hospital, where according to the doctors, the terrorists had shot 3 bullets on his head which resulted in an immediate death. Last reports state that martyr is being shifted to Rizvia Imambargah. In the last two days, 3 Shias have been martyred in Quetta and Karachi by the Saudi-backed armed terrorists in Pakistan. Prominent Shiite lawyer files appeal against one-year jail sentence he was given on charges of insulting Sunni Islam. KUWAIT CITY – A prominent Kuwaiti Shiite lawyer and parliamentary candidate filed an appeal on Tuesday against a one-year jail sentence he was given on charges of insulting Sunni Islam, he said. Khaled Al-Shatti, who is running for parliament in elections on Saturday, said a court had sentenced him on Monday over statements deemed insulting to Sunnis. “The sentence was issued with immediate effect. I can be arrested and sent to jail any time now,” Shatti said by phone. Mansour Haider, the publisher of the news website on which Shatti’s alleged insults appeared and son of a wealthy Shiite businessman, was handed a similar sentence, Shatti said. Shatti’s comments in March last year allegedly criticised former Saudi religious leader Abdul Aziz bin Baz and Sheikh Mohammad bin Abdul Wahhab, the founder of the strict Wahhabi school of Sunni Islam. Shatti categorically denied the charges, saying he had previously been cleared of them by Kuwaiti courts on two separate occasions. “I did not make the statements… the verdict was surprising to me since I am not supposed to be tried again on the same charges after I was cleared twice,” he said. The statements were attributed to Shatti at the height of sectarian tensions between Shiites and the country’s Sunni majority over a crackdown on Shiite dissent in the neighbouring Gulf state of Bahrain. RIYADH: Kuwaiti lawyer Mufrih Ghareeb Al-Mitairi has filed a lawsuit at the office of the prosecutor general in Kuwait against two of his compatriots, a businessman and a lawyer, for defaming the late Sheikh Abdul Aziz Bin Baz (the Saudi grand mufti for most of the 1990s) and Sheikh Muhammad bin Abdul Wahab (the 18th century Islamic scholar) linking their Islamic ideologies to terrorism, the local Arabic daily Al-Eqtisadiah reported Thursday. Al-Mitairi said Abdullah Bin Baz, the son of the late sheikh, has retained him and asked him to file the lawsuit and to see that justice is done. Speaking to the newspaper by telephone from Kuwait, Al-Mitairi said the lawsuit he filed Tuesday against Kuwaiti lawyer Khaled Al-Shatti and businessman Mahmoud Haidar was accepted and the two would appear before court. He said that Shatti leveled false allegations against Sheikh Bin Baz and Sheikh Abdul Wahab when talking to the Al-Adalah satellite channel on March 22. He said the electronic media owned by Haidar also carried Shatti’s statements. “Shatti and Haidar not only verbally attacked the two Saudi Sheikhs but also accused their dawa (guidance) method of encouraging terrorism,” Al-Mitairi said. He said he filed the complaint according to the Kuwaiti law on audio-visual media. He is now asking the court to punish the two defendants for moral and material damages they have done not only to the two Saudi sheikhs but to millions of Muslims who respect and cherish them. ‘We have started extensive moves from the moment Shatti uttered his false accusations against Sheikh Bin Baz and Sheikh Abdul Wahab which were strongly denounced in Kuwait and Saudi Arabia,” he said. “The case is a an example of the misuse of press freedom,” he said welcoming all Muslim lawyers who would be interested to join him in his attempt to bring these two to justice. He said he had asked for civil compensation and for public apology from the two defendants not only to the sons and inheritors of Sheikh Bin Baz but to the entire Muslim nation. Al-Mitairi said Shatti’s false allegations against the two renowned Saudi sheikhs could spread dissension and sedition in Muslim society and ignite sectarian disputes. He said the campaign by Shatti and Haidar against the two Saudi religious symbols emanated from their anger against the intervention of the Arabian Peninsula Shield Forces in Bahrain under the security cooperation among GCC countries. According to Al-Mitairi, punishments in such cases are usually fines and imprisonment or both. “It is enough for us if the two defendants were accused for the wrongdoing,” he said. He expected the Kuwaiti government to make laws to protect the Muslim scholars and the religious symbols from attack and public criticism in media. A number of Kuwaiti writers, columnists and media men have strongly denounced the false allegations against the two Saudi religious symbols and called for bringing the attackers to justice. A court in Qatar, which has backed uprisings elsewhere in the Arab world, has sentenced a poet to life in prison for incitement to overthrow the government and criticising the ruling emir. In his poetry, Muhammad Ibn al-Dheeb al-Ajami praised the Arab Spring revolts that have toppled dictators in four Arab countries since early last year and criticised Qatari Emir Sheikh Hamad bin Khalifa al-Thani. Mr Ajami, 36, who was not present in court, has been jailed in solitary confinement for almost a year during which he has not seen his family, according to his lawyer Nagib al-Naimi. “This is a tremendous miscarriage of justice,” Mr Naimi told Reuters after the verdict, adding that he would appeal. Mr Ajami faced charges of “inciting the overthrow of the ruling regime”, which carries the death penalty. Qatar’s penal code provides sentences of five years in prison for criticising the country’s ruler. Qatar, a close ally of the United States and major oil and gas producer in the Gulf with a large American military base, has escaped the unrest engulfing other parts of the Arab world. Doha finances and hosts the pan-Arab satellite TV network al-Jazeera, which has assiduously covered the Arab revolts, though it gave scant coverage to an uprising last year in neighbouring Bahrain – ruled by a related Gulf Arab monarchy. The Qatari government has backed the armed revolt in Syria, a successful NATO-backed armed uprising in Libya, and street protests that ousted rulers in Egypt, Tunisia and Yemen. But freedom of expression is tightly controlled in the small Gulf state, with self-censorship prevalent among national newspapers and other media outlets. Qatar has no organised political opposition. BEIRUT (AP) — Two US-based Internet-monitoring companies say Syria has shut off the Internet nationwide. Activists in Syria reached Thursday by satellite telephone confirmed the unprecedented blackout, which comes amid intense fighting in the capital, Damascus. Renesys, a U.S.-based network security firm that studies Internet disruptions, says Syria effectively disappeared from the Internet at 12:26 p.m. local time. Akamai Technologies Inc., another U.S-based company that distributes content on the Internet, also confirmed a complete outage for Syria. Syria has partially cut Internet connections during the 20-month uprising assault  against President Bashar Assad but a nationwide shutdown is unprecedented. PESHAWAR: Taliban leader Mullah Nazir was injured in a suicide attack in the South Waziristan tribal region’s Wana area on Thursday, his spokesman Amir Nawaz told Dawn.com. Nazir was injured as a suicide bomber carrying explosives in a hand-cart struck a vehicle carrying members his group in Wana’s Rustam Bazaar. Nazir, who was not in the vehicle at the time but was in the area, was slightly injured in his right leg, his spokesman said. Moreover, five people were killed and eight others were injured in the blast that struck the vehicle. Three vehicles and eight shops were also destroyed in the attack that appeared to have been an attempt of Nazir’s life. The bomber was between 10 to 15 years of age, local administration officials told Dawn.com. 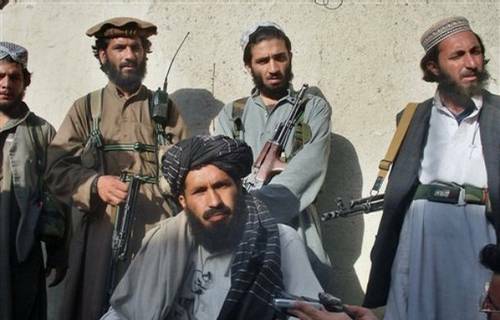 Nazir is a pro-government and anti-US Taliban commander who has repeatedly been targeted by US drones. While at odds with the Tehrik-i-Taliban Pakistan (TTP), Nazir is accused of harbouring militants who stage attacks across the border on coalition troops in Afghanistan. Nazir is also said to have been instrumental in defeating Uzbek fighters in the Ahmedzai Wazir area of South Waziristan. A woman who was found dead in an apartment in St Paul’s Bay appears to have suffered some 40 stab wounds. The grim discovery was made late in the morning on Tuesday in Triq Efesu. Her long-time partner suffered nine blows. Both are Hungarian. According to initial reports, Yvette Gajda, 38 was stabbed with a pair of scissors and died on the spot. The man’s condition was described as critical. The woman, 38, was the mother of two girls, aged 17 and five, who were in the apartment at the time of the stabbing along with another Hungarian woman. The man is the younger child’s father. Neighbours said they had heard the couple quarrelling between 9 and 10am. The police were informed at 11.15am and immediately went to the couple’s apartment. Magistrate Edwina Grima is holding an inquiry. Policemen from the forensics unit are examining the apartment and collecting evidence. Will American Troops Commit Genocide Against American Citizens? Anyone knows, who has half of an eye open, that American citizens are soon to become an endangered species under our present lunatic President. Everyone should know that all of our constitutional protections against an out-of-control globalist puppet regime are melting away right before our very eyes. Everyone knows that Obama, under the NDAA, has the legal authority to “disappear” all political opponents without so much as a trace. Everyone knows that American economy was driven over the fiscal cliff in 2008 when Congress permitted the bankers to plunder our tax revenues and, today, we are just waiting for the official eulogy that the American economy is dead and the real “hunger games” are about to commence. Everyone knows that when the Obama puppet masters in the Zionist Federal Reserve are done plundering what is left of our pensions, our social security, our private property and our 401k’s, that the economy will be collapsed once and for all. And then, what will the American people do? They will do what any generation of Americans would do, they will take to the streets in attempt to rid themselves of the corrupt banker controlled government which has ruined this country. Sadly, this last ditch desperate attempt at regaining our lost liberties will not have a happy ending. Picture, if you will, the veterans groups marching on Washington DC. Imagine bus loads of citizens following the veterans groups which will demand an end to a tyrannical government. Obama will make a formal declaration of martial law. Americans, desperate for food, water and the means to make a living will seek open confrontations with the present administration and this will commence the darkest days in American, and perhaps, even world history. Will American troops follow the genocidal orders surely to be delivered by Obama? Will they begin to secretly arrest perceived dissidents? Will the military follow orders to shoot to kill American citizens who will be desperately looking for their next meal? With FEMA’s performance following Katrina and now Sandy, will there even be a next meal? Don’t hold your breath. When the irresistible force meets the immovable object, what will happen? Will American troops fire, when ordered, upon their American brothers and sisters? There are two possible answers to this question. First, it is a known fact that the military is programmed in boot camp to follow orders like a bunch of Pavlovian conditioned dogs who are well trained in the art of unquestionably carrying out the orders of their superiors without hesitation. From a military training perspective, there can be little doubt that American soldiers will not only fire upon American protestors, but most will do so without the slightest amount of hesitation or conscience. However, the field of psychology provides an even more accurate view of why we can expect the American military to do in the coming desperate times. Not only will our military fire upon us, their fellow citizens, but they will also willingly participate in the round up of dissidents, and the extermination of these dissidents in what has become known FEMA Camps, which will surely accompany the coming martial law. Folks, NORTHCOM has been training for this since the 1990′s. Before I address the psychological reasons on why the coming American genocide is almost upon us and it will receive the enthusiastic support from active duty military personnel, let’s examine the fiction set forth by a group known as Oath Keepers. 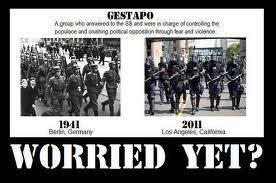 Some our citizens are deluded into a false sense of security by the group known as Oath Keepers. It is a well-intentioned effort to remind both law enforcement and the military to uphold the Constitution and to disobey unlawful orders which would bring harm to American citizens. Under the this false sense of security, many in the American public really believe that American troops will not fire upon American citizens in the impending civil disobedience which is sure to follow Obama’s Sovietization of the United States. The Oath Keepers have all but assured the American public that both law enforcement and the military will refuse to obey unlawful orders to commit genocide against protesting Americans. Anyone who believes this fiction is self-delusional. As you will see in the following paragraphs, history has already answered the question as to whether anything beyond a small minority will actually resist committing atrocities against the American people. The world of psychological research provides the definitive answer to whether we should fear our military in the coming storm ahead in the form of a phenomenon called groupthink. Groupthink is often described as a decision-making process whereby the group members go along with what they believe is the consensus. Groupthink has also been used to describe individual acquiescence to authority even when the authority has limited power to enforce compliance. Groupthink often causes groups to make hasty, irrational decisions, where individual doubts are set aside, for fear of upsetting the group’s leadership and balance. Just how far will people go to please authority figures and subsequently do what they know to be immoral? The first known laboratory test for groupthink occurred in 1963 by Yale professor, Stanley Milgram. Subjects for this landmark study were recruited for the Yale study through newspaper ads and direct mail. The participants were men between the ages of 20 and 50, from all educational backgrounds, ranging from an elementary school dropout to participants with doctoral degrees. Milgram wanted to determine what percentage of people would willingly administer enough progressive electric shocks which would result in death simply based on the orders of a perceived authority figure (i.e., the experimenter). 1. The Teacher was the real subject in the experiment. Their role was to administer shocks for each wrong answer provided by the learner. How far would they go, was the true subject of the experiment. Would they actually kill a person for failing to provide the correct answer on a word pair test? Would they mindlessly follow the orders of the experimenter to continue with the abuse, regardless of the results and obvious harm being perpetrated upon the pretend victim in the experiment? 2. The second participant, the Learner, was actually a plant in the experiment. The Learner would sit in an adjacent room and pretend to be shocked for each wrong answer that they would purposely give. Eventually, they would cry out for help and beg the Teacher to stop administering the electric shocks. Their cries included pleas of mercy that were often based on an unknown level of self-expressed cardiac distress that they were pretending to experience. 3. The Experimenter was a stern looking fellow who carried a clipboard, wore a lab coat, and would urge the Teacher to continue regardless of the make believe pleas of the Learner. The “Teachers” were told by the experimenter that they would be participating in an experiment to test the effects of punishment on learning. However, as has already been stated, this was not the goal of the experiment. subjects believed that for each wrong answer, the Learner was receiving an ever increasing level of actual shocks which would eventually result in death. In reality, there were no shocks. After the confederate (i.e., Learner) was separated from the subject, the confederate set up a tape recorder integrated with the electro-shock generator, which played pre-recorded sounds of pain and distress for each successive level of shock. After a number of voltage level increases, the Learner would bang on the wall which divided him from the subject (teacher). After several instances of banging on the wall and complaining about his heart condition, the learner provided no further responses to questions and no further complaints. The fate of the Learner was left to the imagination of the teacher. The silence was met with the command to continue with the experiment. Although the Learner was not being harmed, the Teacher believed that they were administering progressively dangerous shocks. From the instrumentation panel, the Teacher could clearly see that their shocks were approaching the level of lethality. Was the Teacher being forced to capitulate and continue with the experiment? Quite the contrary was true, the prompts to continue administering shock were encouraged by minimal prompts and absolutely no threats were offered by the Experimenter. If the Teacher still wished to stop after having listened to four successive verbal prompts, the experiment was discontinued. Otherwise, the experiment was terminated after the subject had administered the lethal 450-volt shock three times in succession. Milgram expected that less than one percent would actually administer a fatal electric shock. The actual results were so stunning that he decided to film the results on the final day, fearing that nobody would believe his results. And what were the results? Despite expressing some measure of discomfort and the minimal use pressure, in Milgram’s first set of experiments, 65% (26 out of 40) of the subjects administered the experiment’s final and hypothetically fatal 450-volt shock. Amazingly,no participant steadfastly refused to give further shocks before the 300-volt level! 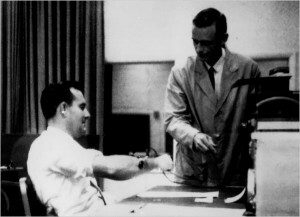 Milgram’s results were confirmed when Dr. Thomas Blass performed a meta-analysis on the results of repeated performances of the experiment. Blass found that the percentage of participants who were willing to administer fatal voltages remains remarkably constant, between 61% and 66%. The results of Milgram’s and Blass’ work are stunning in their final conclusion which demonstrated that almost two-thirds of all Americans will mindlessly follow the commands of a “perceived” authority figure even when the authority figure has no real power over the people. Is this why our military continues to serve a despot who does not hesitate to throw away their lives or anyone else under his charge such as Ambassador Stevens? To achieve political success, every authoritarian regime requires a high level of voluntary cooperation (i.e., groupthink) from its citizenry. Cooperation can be coerced as many times, in dictatorial regimes, cooperation is obtained as a result of extreme intimidation by carrying out a relatively small number of exceptionally harsh punishments in order to serve as a warning to the masses. However, there are not enough police, inspectors, auditors, etc. to control a populace in which the majority would fail to comply with the status quo. Then why do we continue to follow leaders who have abandoned the Constitution and the welfare of our people long ago? Is America a prisoner to the groupthink phenomena? What about gross ignorance as a contributor to America’s capitulation to such bad leadership? Can anything be done? Now that we have had the confirmation of FEMA Camps, are you concerned about the propensity for the American people to follow directions right to the planned extermination of Americans as planned by the globalists? I wholeheartedly support and applaud the efforts of the Oath Keepers. However, when one considers the conditioned response training of the military and the propensity for even nonmilitary personnel to blindly follow orders, through the process of group think, I think Oath Keepers may only be able to exert a very minimal effect on the overall outcome as it pertains to the American troops committing genocide against the American people. Part 4 will examine what options Americans, who steadfastly refuse to accept the tyrannical government that we are increasingly being exposed to, have at their disposal to combat the coming American genocidal holocaust. Any/All dictators will local citizens to defend and carry out their reign of terror. The USA will be no different. Another eye opening article for all to ponder. Thanks! This article is the only one of it’s kind, because Dave Hodges asks the question that no other American would: “Will American Troops Commit Genocide Against American Citizens?”. I can tell anyone from personal experience, the late 20th to early 21st century military is comprised of “Muttonheads”. Yes, i said it, someone finally has to. I am sick of all the blind patriotic idiocy that American citizens show for “Our Heroes” . Next to 0 of American troops admit to the fact that they are accomplices to Illegal Wars and Occupation. Next to 0 of American troops admit that countries like Iraq and Afghanistan are worse off than before the US invaded! Next to 0 of American troops admit that “conspiracies” such as Operation Northwoods (which is identical in function/scope to the invented “War On Terror”) actually exist. I, myself nearly got into a brawl with enlisted nitwits who denied it even existing when I asked about depleted uranium ammunition and armor, even though G.I.s are being poisoned by said armor/ammo! Not to mention the scores of deformities and child birth fatalities to the Iraqis and others nations citizens who are constantly exposed to that radioactive crap. The answer is yes yes and yes! American Troops will turn on American civilians! I don’t care how many Vet parades you go to, no matter how much you donate to the USO, no matter how many CARE packages you send to “our boys” in Iraq, those clowns will turn on you as soon as they get the command because they are not capable (for the most part) of rational thinking and foresight. They literally have a cartoon mentality, (autobots vs decepticons) with no grey area between. I am also pretty sure that under the coming mass amnesty Obozo may make it a requirement that all (presently) illegal aliens serve under Obama in his civilian force before they can finalize the process of becoming “legalized”. A force just as big and just as strong as the military. A force which will have no qualms about firing on Americans, who have been conditioned to hate Americans and seek out revenge for perceived wrongs done to them taught to them from birth by their rabid Marxist teachers, mentors, and leaders–no matter what side of the border they operate from..
even if this “civilian” force never materializes the US military WILL do the job, except that with all the wars and operations going on around the world it just doesn’t seem to me that they have enough available men to get the job done without extra help. The UN? China? Hmm. It seems there comes a moment when one passes over and beyond the ‘point of no return’ line, in terms of the Groupthink, i.e. the mind is unable to stop the program and a total reactionary sequence jumps into play based on “all” the uploaded, inputed data, e.g. TV programs/commercials, movies, IRS fear tactics, smart meters, HAARP, Rx and Non-Rx drugs, GMO Food, School indoctrination, etc., etc., etc., from the moment one was conceived all the way to the molded and manipulated form we find ourselves in now. The Human Mind is much stranger than I could have ever imagined. Which has got me thinking about one rather strange concept, i.e. what it takes to “kill” someone. I’ve been “preparing” for many years now, for the field of all possibilities regarding the great storm brewing “just over there” and, in the process of adequately preparing for “that” day, I’ve acquired various “tools” to defend myself and loved ones against “certain forms” of tyranny. Even though my mind says, “Do what you need to do to stand up for righteousness”, my heart wonders what might be the short term and long term repercussions to that vulnerable organ, if I were to succeed in achieving that object. It seems so diametrically opposed to the nature of life, i.e. ending someone else’s rather than supporting it. Of course, with all the TV and Movie Groupthink programming taking place while being plugged into that world as a youth, it seems as “easy” as playing a video game (which, incidentally, I only participated in a few times, years ago). We’ve been lucky in America. Last civil war was before any of us were around. Seen civil wars on TV/Films, but never up close and personal.